Good morning all! I am super excited this morning and I thought I'd share my good fortune with you all, as this is directly related to my Transatlantic trip. Side Note: I think I'm gonna have to come up with an official name for this trip & then an abbreviation for it. Anyway. So as I told you guys in an earlier post I am in the market for a PacSafe backpack. Well I found the one I wanted. It's $100. I really didn't want to spend $100 on a backpack, but I knew I'd feel more comfortable having it. So I decided to shop around a little. 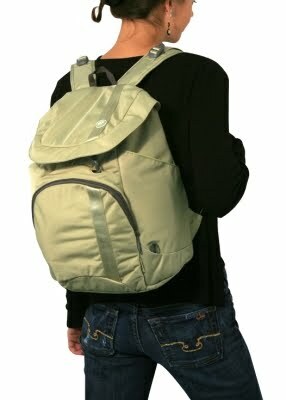 Well I ended up finding this exact backpack, brand new, with tags on ebay. I bid on it last night and I won it! No one else bid on it which I was shocked about. The bidding ended in the middle of the night so I was really paranoid that I'd get out bid while I was sleeping, but apparently no one wanted a $100 backpack for $50 bucks. Go figure. I'm not complaining. I was so excited about this win that I broke out into interpretive dance. I call it "the 40 year old midlife crisis dance". Now without further adieu. The PacSafe RoamSafe 100 Travel Backpack...safe. Sorry, was just kinda on a role with the word "safe". It felt right. Is it me or does the voice in this video sound just like Heidi Klum?? I thought so. Till next time! 76 days!! Today is a big day for my blog. Today is the official start of my Transatlantic Planning Extravaganza. To be technical, I have been planning this for this trip for quite a while, but it's now finally time to start to share my plans. Plus, I really need to share this stuff because I've become obsessed. 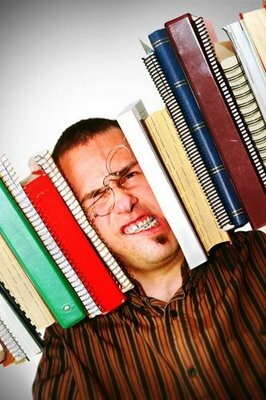 I have been reading, researching, rereading, booking & rebooking so much that I think I'm gonna go insane. I have read & researched so much you'd think in 78 days I was taking my medical boards, not going on vacation! I'm gonna need a vacation from planning my vacation. I'm really starting to think I should be charging my parents a fee. I mean really. How spoiled are they?! I digress. If you are new to my blog or need a refresher course you can check out my earlier posts that explain this trip here and here. Where do I even begin? I guess I'll go in the order of our trip. Today I'll do a quick rundown of our flights and my first thoughts on packing. We will be flying Air France (Delta) to Dublin on Monday, September 13th leaving JFK at 10:40pm and arriving at DUB September 14th at 10:30am. First things first, I can not tell you how something so small like flying in & out of airports with the appropriate abbreviations excites me. HPN & MCO are you listening?! Anyways. No, our flight is not 12 hours. Dublin is 5 hours ahead of us. Our flight is only 7 hours, which is totally doable. Seriously, I have six 11+ hour flights under my belt & two of them I did when I was 11, so long flights don't bother me. Actually, I find that the longer the flight, the quicker it feels to me. With these long flights, between the nonstop food, personal tvs with movies, tv shows, games and music, sleep and reading they fly by, literally & figuratively. Our plane even has power outlets for my laptop, so I'm good. Maybe I'll even do a little blogging from the air. The seating situation on our plane is 2-3-2. So for my sanity we have my dad on the aisle of the middle triple row and then my mom on the aisle on the double row and then myself at the window of the double row. This is just a better situation for everyone involved. (aka me) These flights are usually never completely full so when we do seating like this, my dad ends up with an empty seat next to him, 'cause who likes to sit in the middle seat?? I don't! Air France (Delta) allows one checked bag each free of charge for long haul flights so that worked out well. After our 3 days of fun in Ireland, we'll be taking a quick flight over to Barcelona. This flight we'll be flying Aer Lingus leaving DUB at 6:40am and arriving at BCN (I love it!) at 10:10am. This flight is 2 hours 40 minutes, Barcelona is an hour ahead of Dublin, 6 hours ahead of home. Since we will be flying within Europe, this flight dictates our packing situation for the entire trip, as they are much more strict. Aer Lingus is a tricky one. We are allowed one checked bag each weighing no more that 44lbs (20kgs) which they charge 15 euros for each, about $19 usd! We will also be charged an additional 15 euro ($19usd) for each 2.2lbs. (1 kilo) over 44lbs (20kgs) we are. Yeah, so one bag each weighing no more than 43lbs for us! Just to be on the safe side. Our last flight will be our flight home from MCO (ugh!). We'll be getting off the ship in Port Canaveral, Fl and taking Disney's shuttle to the airport. We haven't booked this flight, as we're hoping for a sale. It will end up being a Jetblue flight to either White Plains airport or Laguardia. and it will be pretty uneventful I'm sure. They do not charge for the first checked bag. Why can't they fly to Dublin and Barcelona???!! This is the thing that has me most concerned about the trip. We will be packing for 18 days, seeing three different "seasons" and needing clothing for all types of events from swim suits to evening gowns & suits. God help me! The cruise ship has three laundry rooms as well as laundry service, so you can bet we'll be taking advantage of that service. Yes, I'll be doing laundry on vacation, unless I can work a miracle packing wise. I mean the start of our trip we'll be seeing temps of 49 - 62 degrees in Ireland, then temps in the mid 70s in Spain and then ending with temps in the 90s in the Caribbean. I haven't even begun to figure out what clothes I need to buy. I have started to buy little items here & there each month, so that I'm not hit with a huge shopping expense in September. Because every pound counts, I have been measuring out exactly how much shampoo & conditioner, etc. I will need and buying travel bottles that cary exactly that much liquid. So far I have bought some 8oz. & 3oz. bottles, travel size bag of cotton balls ,travel jewelry case, travel size hair brush, among other things. To help with packing we will also be carrying a 21" (biggest they'll let us) rolling carry-on each as well as a personal item, mine will be my new slash-proof backpack. Barcelona is famous for architecture & pickpockets. So I am buying a PacSafe backpack and camera strap. You can check those out here and here. They are really cool and the best part if I've found them half the price on ebay! Gotta love ebay. My plan is to put all of my electrical stuff, jewelry and other heavier items in the rolling carry-on with my laptop and dslr camera and then my important papers, money, point-and-shoot camera & smaller things in my backpack. That should help with the weight of everything and I may be able to fit enough to not need to do laundry. Now, you'll notice this leaves me no room for souvenirs. Believe me I'm planning to shop A LOT! So how am I gonna do it? 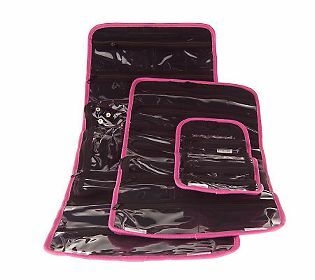 First, I'm packing one of those fold up, lightweight duffle bags in my suitcase. I will have to leave room in my suitcase/carryon for whatever I buy in Ireland, but once we get on the ship it wont matter. Then I'll do the rest of my shopping. On one of our last stops is St. Maarten, shopping mecca. By the time I get to this island I'll have a pretty good idea of how much more room I'll need, so I'll buy a second suitcase there & then just pay for a second bag on our flight home on Jetblue, since the first bag on Jetblue is free. See! I'm telling you. I have literally thought of everything! I think I just may have to charge my parents. So that's the packing situation. I'm excited to be able to get started on that, as I've always loved Tetris. Two more things I definitely need to buy is a 18 day supply of gum, no Disney property, including their cruise ships, sells gum, only mints. They're smart, kids+gum+miles of carpet & upholstery=disaster! Also, I'm in the market for an eReader. I'm pretty sure I'm gonna go with Kindle but I'm not positive. This is going to be a splurge on myself. I don't really have that much time to read and therefore I don't read often, except for while on vacation. With the luggage limitations I'm going to have and the amount of free time I'll have to read (five days straight at sea), I need an eReader. If you have an eReader, please leave a comment about which you have & how you like it. I'm surveying everyone! Well that's all I'll subject you guys to for one day. It's actually been quite a busy Saturday for me and it's not even halfway over yet. Because I know how everyone loves pictures I've posted some pictures of the travel items I have purchased. Nothing exciting, but apparently people like pictures, even if it's of shampoo & deodorant. Go figure. Final Day... only a month later. Hello world! This is your terrible blogger back after a month hiatus. There are no excuses, but I'm gonna give em to you anyway. Because I can. So returning home in the middle of a work week, was my first strike against me. Add on top of that, that June is always my busiest month at work. 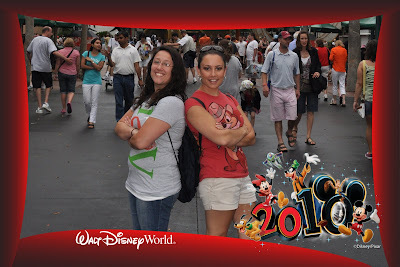 Then I was waiting for my Photopass CD to come in to share some of our other photos. Then I got sick & I mean sick! I won't get into details, but I was puking my guts out! Too much?? Next I lost my right arm in a freak accident. Turns out chain saws are sharp! Who knew? Then a tree fell on my house, only hitting my bedroom. Then there was the great astroid strike of 2010. Then Father's Day. Oh, and then I ran 5 marathons. Then some idiot hacked into my iTunes account, locked me out of it & bought $125 worth of music on my credit card! Ok, I'll stop. I'll just wrap up our final day & then starting tomorrow I'll be back to your regularly scheduled programing, 'cause my big Europe trip is coming quick! 82 days and counting!!! So our final day we had to be out of our hotel room by 11am. We decided that we would spend the day at Downtown Disney and Disney Quest, the 5 story arcade. So we got up, packed and were out of our room by 8am. We brought our luggage down to the lobby and checked-in for our flight. I love Disney. They took our checked bags and then we left our carry-ons with bell services. We headed out to get our bus to Downtown. Once we got to Downtown Disney we had our final meal on Disney property and boy was it good. (There are pics on my photo website.) I think it was both of our favorites from the entire trip. I got waffles with whipped cream & fresh strawberries. Kristin's took the cake though. Kristin got corn flake crusted french toast that was also served with fresh strawberries & whipped cream. HOWEVER her "french toast" was actually three bagel halves! Breakfast was to die for! If you are ever at Downtown Disney in the am head straight for Wolgang Puck EXPRESS on the Marketplace side, next door to the Christmas Shop. Don't, I repeat, don't, ever eat at the other Wolfgang Puck restaurants on the West Side by Disney Quest. Although they are owned by the same people they are totally different! It's like good and evil. I only suggest going to the other one if you are doing research on how to run the worst restaurant in the history of the world. Seriously. I digress. After our wonderful breakfast I got stopped by a life-sized Barbie doll originally from NJ, but now unhappily living in Fl. This woman overheard me talking to the cashier that we were headed back home to NY & when she heard that she literally jumped me. By the end of our conversation I was confident that I would find her stowed in my luggage. It was the most interesting conversation I have ever had with a stranger. Probably, because it is the only conversation I have ever had with a stranger, (people allergy remember?) but who's keeping track? The conversation was all about how much she wants to live in NY & how she HATES living in Fl but her former NYer husband does not want to move back. Then the conversation somehow took a strange Dr. Phil turn where she was telling me how great I was and how she could tell just talking to me how I had good morals & that I would find a husband with the same morals & same love for living in NY. Then she shot a look at her husband. You know, one of those, "why did I marry THAT??" kind of looks. Kristin & I took our cue to get the heck out of there before it turned ugly. It was strange, but I'll take compliments any way I can get them, so I just sucked it up & stabbed myself with my Epi Pen & I was good. Next we did a little last minute shopping. I found a great book for my big Disney cruise coming up. It's a scavenger hunt of all the hidden Mickeys on the ship. If you have no clue what I'm talking about, check this out, Hidden Mickey?. They sell books on this stuff! It's very addicting and you'll never be able to walk through Disney World or any other Disney property the same. Actually, you'll start seeing Hidden Mickeys everywhere! You'll see. After our shopping time we headed to Disney Quest and played all kinds of video games. Kristin even got me to play Guitar Hero. She tells me I did really good for a beginner, but I could of been the world's worst Guitar Heroer and how would I have known. She's good. Next we played some old school video games, air hockey, etc. After we had enough of our 14 year old boy moment of video games we headed to the bus but not before getting Kristin a Doh-Bar and spending all of our left-over snack credits at Goofy's Candy Company. YUM! We took the bus back to our hotel, picked up our carry-ons, changed into jeans and then sat for about 45 minutes in the lobby reminiscing until it was 4:30pm when our Magical Express bus was arriving to take us to the airport. Sad. We got on the bus for the 30 minute ride to the airport and watched a little cartoons, followed by a Farewell Video from Mickey & the Gang. We got to the airport and bypassed check-in, I love Disney, and headed straight for security. That was pretty effortless. We had dinner at the best place on the planet, McDonalds. No sarcasm there, that is literally Kristin & I's favorite. No addiction! After dinner we sat at our gate and stalked the most adorable guy on the planet. He was so cute. Kristin & I were mesmerized. We were really excited too, because it appeared he was a fan of Disney World. Nothing like a guy secure enough to love Disney World. We were staring so much that he noticed & started to smile back! We really got his attention and when it was finally time for us to board our plane he tried to escape his stroller to come with us. Come on people, I don't pick up men in airports. Remember? I have good morals, says Barbie. The storms that I had been worried about were there on & off while we waited for our flight but by the time our flight took off they had passed. Our flight was pretty uneventful. We landed in HPN (don't get me started again!) got our luggage and then went home to bed. Kristin spent the rest of the week sleeping in and recovering from our trip, while I got right back to work the next morning. What a brat! It was a great trip! They say if you can vacation with friends, they truly are your friends. I think after this week, Kristin & I realized that we're not friends, we aren't like sisters, we're clones! We lost track of how many times one of us would say something and then the other would say, "I was just going to say that!". It's crazy when you meet someone so on the same page as you, but if you do you are truly blessed! Kristin is such a blessing in my life & I am so grateful to have her in my life! Kristin & I will be vacationing again together soon. Our families are going on a big group cruise next summer & she will be rooming with me. She will have just graduated college and has no clue what will be in store for her by then, but we're not giving her an option. She's going! So stay tuned for more Kristin/Lisa insanity! Also, as soon as I post this I'll be headed over to upload the last of our pictures as well as our photopass pictures, so be sure to use the link on the left to go to my photo website. Up Next... 18 Day Europe Extravaganza planning & babbling!